Added 2 extra pattern repeat in the row, so casted on 85 stitches instead of 65. 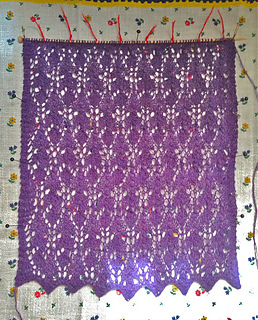 The first part of the pattern, called Thistle Lace, is the trickiest because it has a long pattern repeat (28 rows). Luckily the WS is almost all purl, at least. 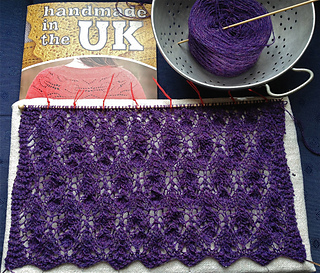 The second part (Column Lace) has a very short repeat and looks very straight forward. Yarn on cone, winded into cakes. Slightly blooms after washing. 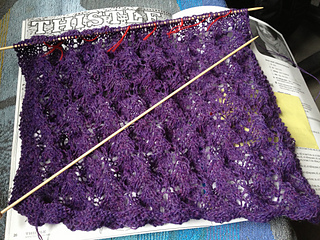 The Shetland lace yarn I’m using is much thinner than the one the pattern called for, so I’m using it double.